I haven’t been so excited about a quilt top in a very long time! 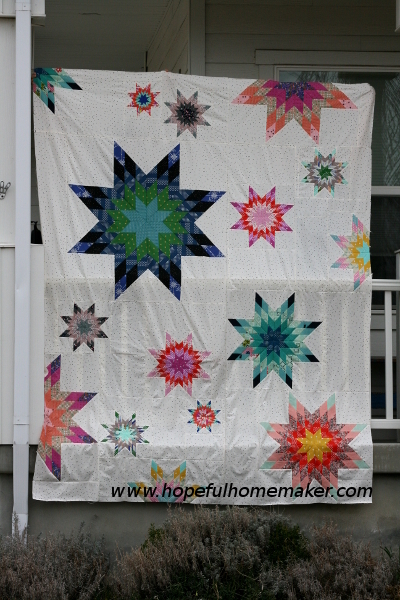 Meet my Lone Star Party quilt, a lone star quilt with eight different sizes of lone star blocks. I love this traditional quilt block, but really wanted to find a way to break it out of a traditional setting, and also to demonstrate how adaptable it is. I feel like this improv setting of so many sizes is modern and refreshing. One of the things I love about the lone star block is that once you learn how to make it (and it’s really quite simple) you can change one measurement and have all kinds of sizes. The process is one that has become really enjoyable and rewarding for me, especially since the finished star has so much impact. 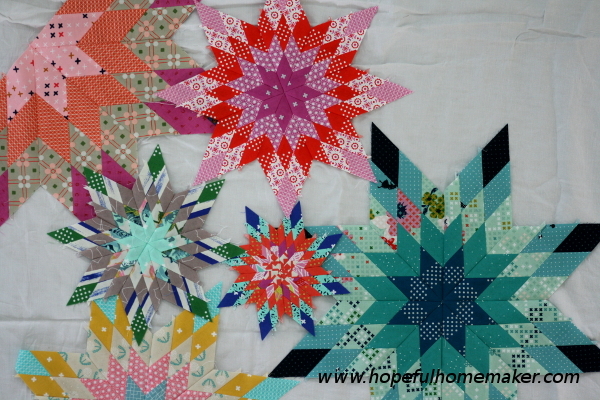 Making these stars was a lot of work, but totally worth the time and effort! I decided to use a mash-up of Cotton + Steel fabrics with just a few other prints thrown in. 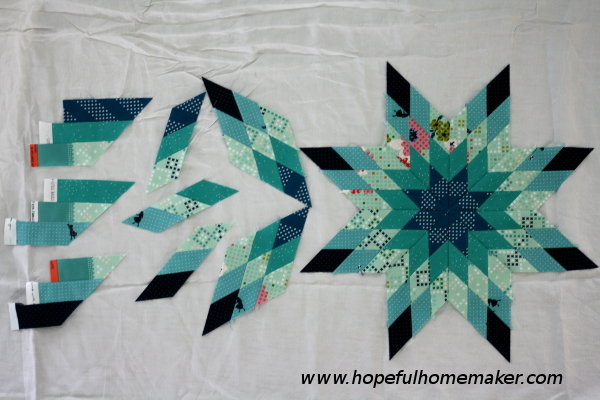 You can find my tutorial for making your own lone star block here. 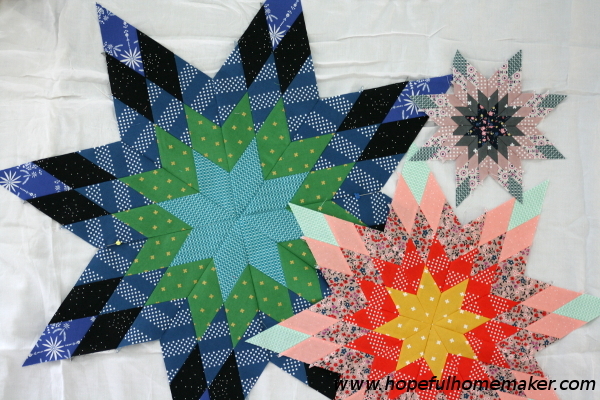 It’s a detailed, step-by-step, full of photos tutorial that also includes a PDF that highlights the basic steps for making a lone star block. 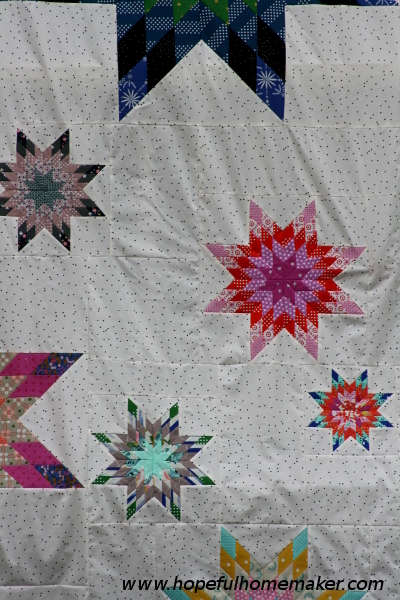 The PDF contains a table for adjusting the size of a lone star block by changing the width of your strips. All of the sizes in the table except for one are represented in this quilt top. Please visit my Lone Star Tutorials page for more links to my lone star projects and tips! For my background I chose the Firefly print in Whisper by Bonnie Christine for Art Gallery Fabrics. It’s from her Hello, Bear collection. 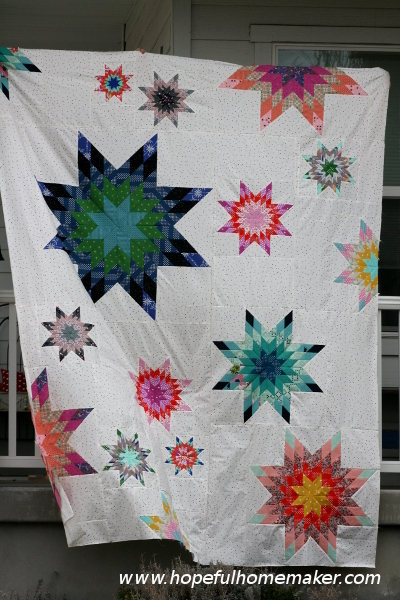 I selected it because I wanted a print that would help hide all the seams in the quilt top, and also because it continues the illusion of a star-filled sky. This project has been in my head for years, and I’m so glad I finally made the time to bring it to life. I keep feeling like I should choose a favorite star, but I love all of them. I love the way the fabrics look together, and how all these stars show off and yet compliment one another too. I am so excited and happy about this quilt! It makes me smile. Can’t wait to show you more! A beautiful, amazing quilt Jennifer. Your creativity is so beyond wonderful. I love looking at your work. Thank you for sharing. It is beautiful and fun to look at, a real work of art!